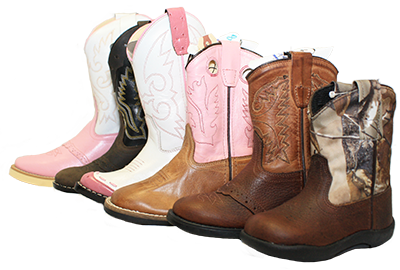 We’ve got boots for every kid out there… boys, girls, infants, toddlers, children and youth! Our selection of kids boots is constantly changing to keep up with the latest styles, so here’s a quick look at the types of kids boots we have year round. Boys, girls and unisex styles. 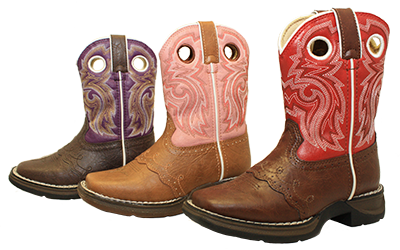 Pull on western style boots, leather or man made varieties. Narrow and wide round and square toes. Man made soles (Neolite, flexible TPR or rubber). Narrow or wide round toes. Sizes 5.5-8 (toddlers), 8.5-3 (chilren), 3.5-6 (youth). Pull on western style boots, leather and mad made varieties. Narrow and wide toe options. Flexible rubber or leather outsoles.